It all started with my friend, Mary from New York, sending me a package of sunflowers as a symbol of happiness, smiles and “keep on truckin.” Mary and I met as riders on the 2012 Donate Life Rose Parade float and have remained friends. She is the picture of perseverance and I admire her in so many ways. So I thought it would be cool to plant her happy sunflower seeds in my garden when the appropriate time in spring arrived. It did and I did. The little seeds (along with mammoth sunflowers that my sister had given me) were nursed, watered and carefully watched as they broke through the soil to start their growing process above ground. They were doing beautifully until one day I noticed nibbles had been taken off the leaves. Oops. Those dang ground squirrels weren’t satisfied with the bird seed they steal from my birds, they had to have a variety in their diet. Oh no, they had to have green stuff too! 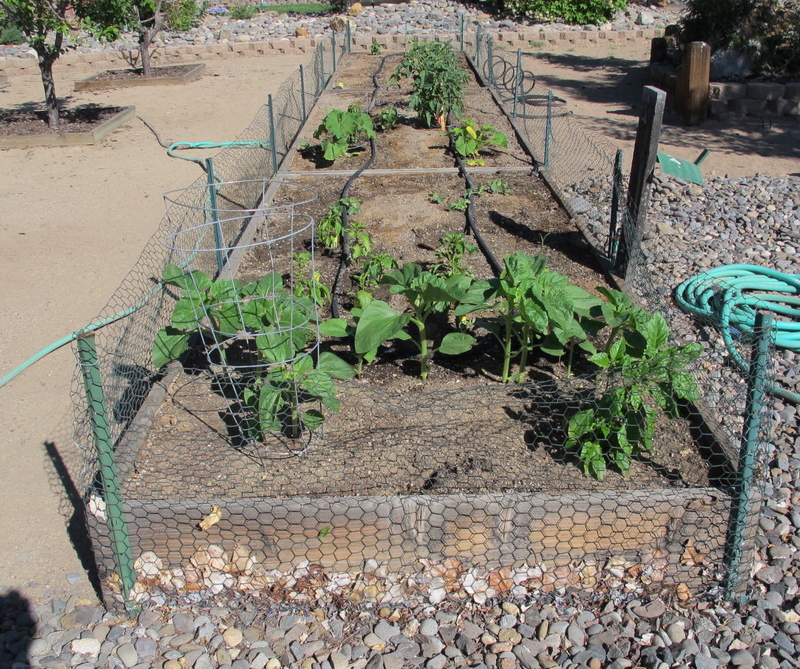 Quickly, I put chicken wire over the raised garden, but was able to save only two of Mary’s sunflowers. If things go right, they’ll grow to maturity and I can save many of their seeds for next year’s crop to plant in her honor. The Garden with Mary’s plants in the left front. Mary’s plants are the ones with the little wire structure around them. That’s not to prevent squirrel damage, it’s just to help support them. I think they are getting tall enough now that they won’t be damaged any more. The only problem is that the squirrels moved down to the other end and ate three kinds of lettuce plus all the spinach. This weekend, I’m going to try again to replant the lettuce, etc. This time, I’ll have chicken wire over the plants. 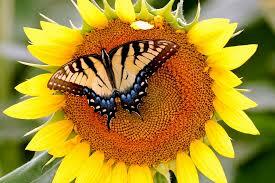 Then Jerri suggested planting more sunflowers along my back fence. “They would be so pretty waving in the wind,” she said. That sounded like a great idea and I did that. Again, I watered dutifully (there is no drip system along the back fence) and waited for the little plants to break through the surface. Soon I saw results and soon most disappeared. I was able to put wire around some of the plants and they are growing. Two growing sunflowers. Check how small the square fence is in back. Squirrels can zoom through that little area! 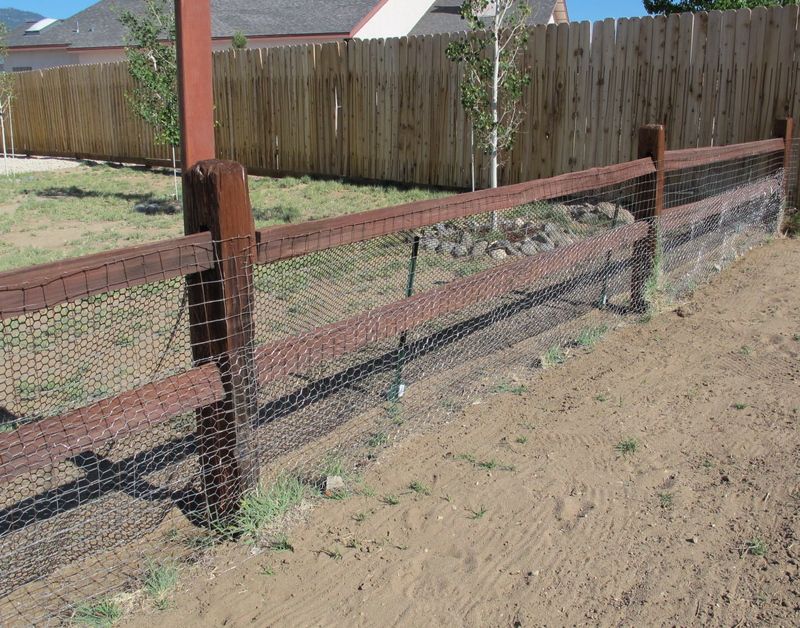 I replanted with some fencing on the front side, forgetting that the squirrels can zip right through the 2” squares of the back fence. Sometimes they bang their heads on the fence when they are running through, but it’s basically no problem for them to go through such a small area. I went out a couple of hours later to find that the varmints had dug up every single seed! I think they probably carried a little basket with them, sort of like the Easter Bunny, laughing all the way about their free lunch. Ok, now it’s war!!!! 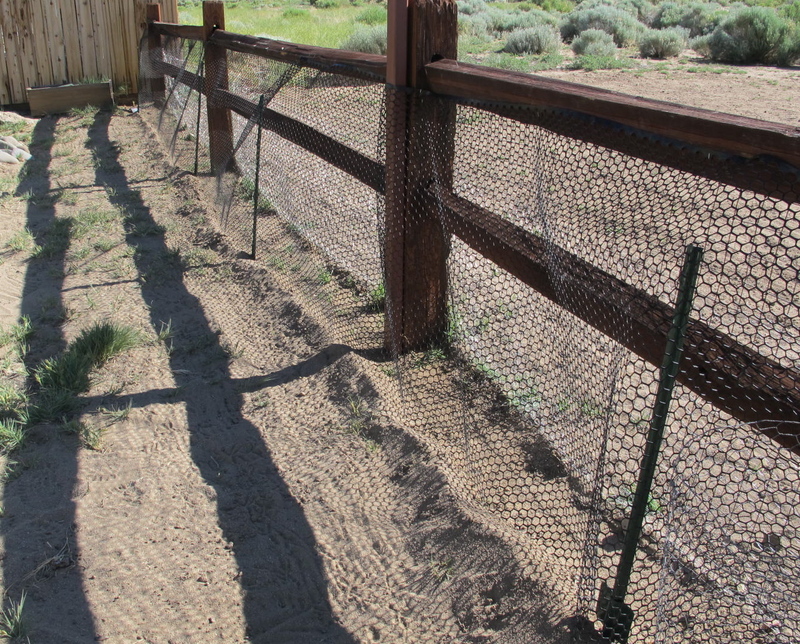 I took what chicken wire I had left and stapled it to the back side of my fence and then bought some new plastic fence (Home Depot was out of chicken wire, plus the plastic stuff doesn’t scratch my skin as easily) to line the front side of the fence. This will do it, I thought. Again, I planted the seeds and had to buy some more because I ran out of Jerri’s leftovers from last year. I went out the next morning and there was Mr. Squirrel inside the fences happily digging up my seeds. I discovered that I hadn’t put enough stakes along the bottom edge to anchor it securely. Rats! These sunflowers are probably going to be the most expensive sunflowers ever! At this point, I was pretty frustrated with the varmints and thought about getting a BB gun to shoot them. But I’d have to shoot them while they are stealing from the bird feeder and that might not be safe for the birds. Also, if I just wounded one, then I’d have to whack it over the head to kill it. That would not be a pleasant option. I’ve already put out squirrel repellant, but they just laugh at that. I almost gave up but thought that I can’t give in to a ground squirrel and his family. So I went to Home Depot again to buy up more anchor stakes to try to make the little area more secure. So far, knock on wood, nobody has gotten into the sunflower area. But then, it’s only been about 16 hours since the last planting. 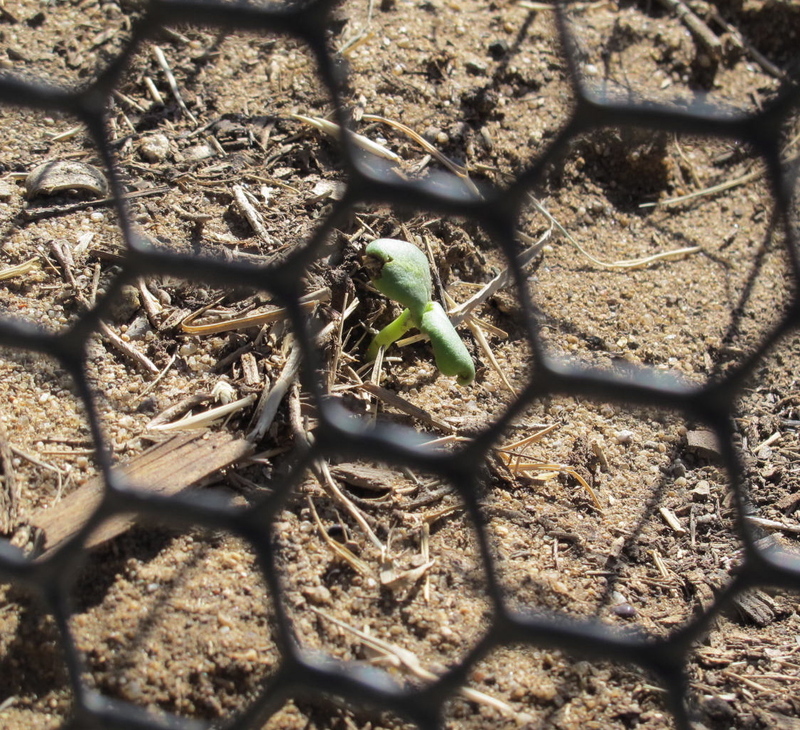 This picture is the lone survivor of the second planting. 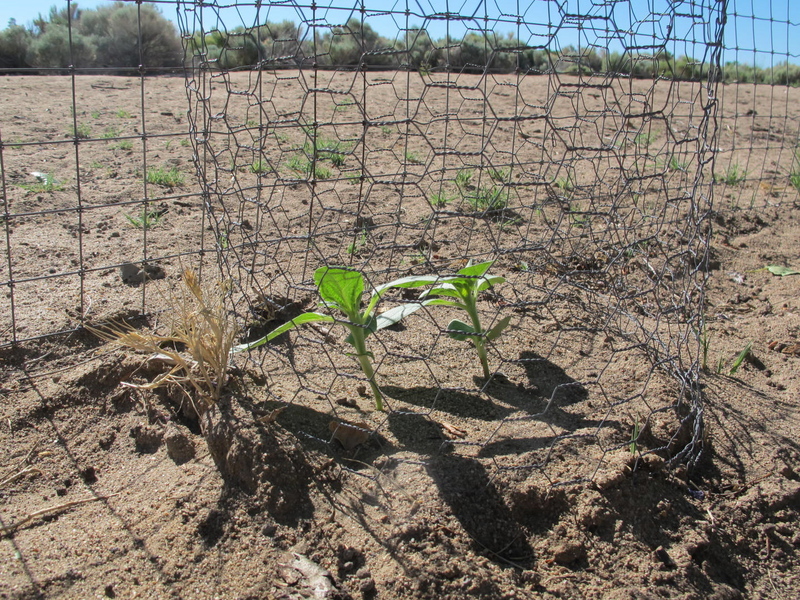 It is now encased in the sunflower cage. I hope it makes it to be a tall, beautiful plant that greets the sun each morning. 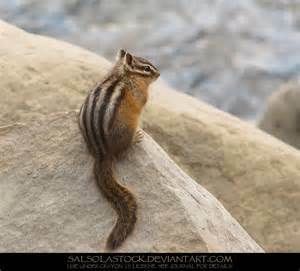 The picture below is representative of Chip, a tiny chipmunk who has also discovered the free eats at the Johnson bird feeder. Chip doesn’t eat much, unlike those ground squirrel varmints. I tried to download a picture of one all sprawled out on the sand, but it wouldn’t download. Chip did that the other day and was very cute. 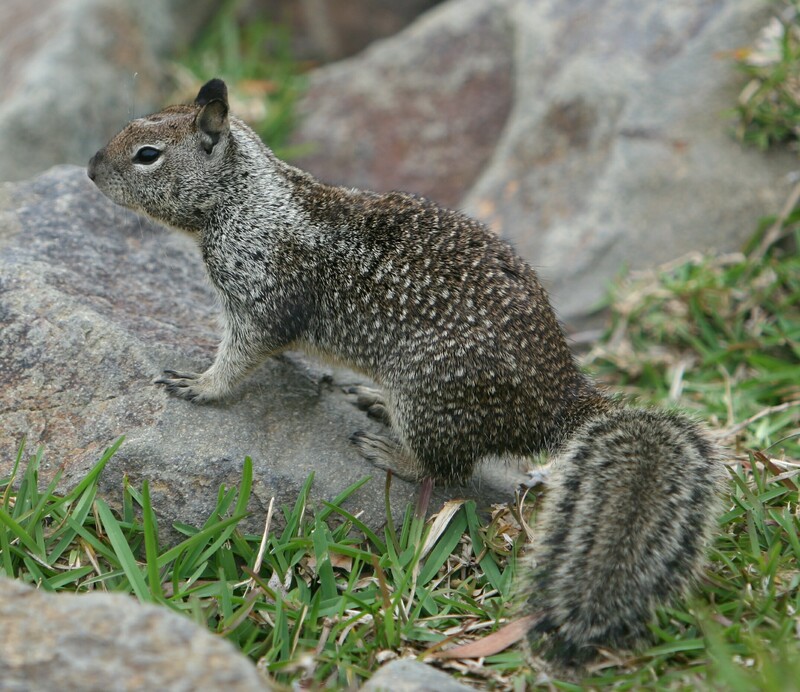 His cousin, Earl, a white tailed antelope squirrel, hasn’t been around much recently, I don’t know where he is except that a coyote might have had him for a snack. The upshot of this saga is that, in a very small way, I can understand what farmers, particularly organic farmers, go through to rid their crops of pests. It’s a very frustrating, expensive and time-consuming job…especially if one is trying to make money at it. Perhaps I need to do more research on how to accomplish this endeavor, not to make money, just get the job done. P.S. You might ask why I’ve named Earl and Chip but not the varmints. Those varmints are pests. If I don’t name them, I don’t become attached to those piggy, cootie carrying critters and I could dispatch them if I had to. Another note: Jerri’s dog, Max, caught a ground squirrel in their back yard yesterday. Perhaps he could come over to mark my land and try to catch a couple of those varmints. The only problem is that he won’t get into a car, an issue that is from his puppyhood. Double rats!